First of all, I am so excited to share this project! Ever since I have known Scott, he has had this old dresser - so of course, it made the move to our condo. At the time, I was not as into home decor and apparently did not know the treasure I had on my hands. 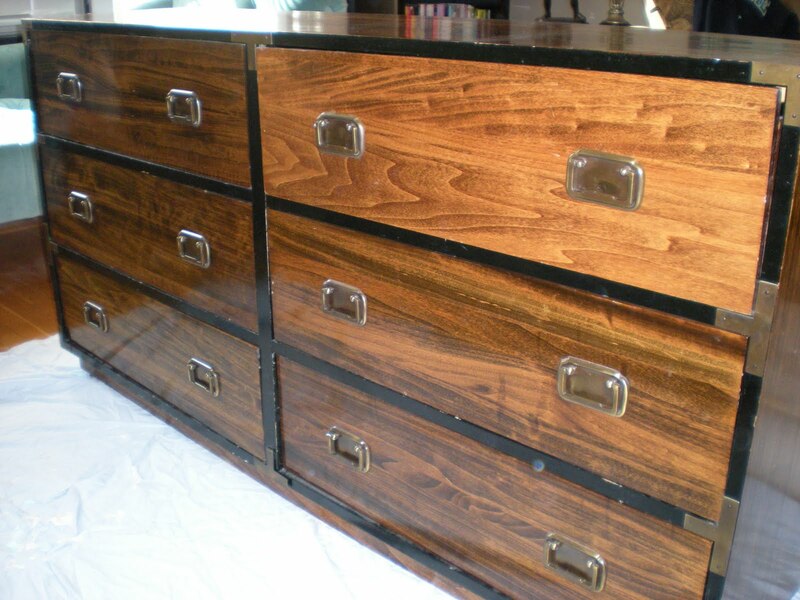 A couple friends commented on how cool the dresser was, but I still thought it was dark and a little ugly. In my blog reading, I came across this post on campaign furniture from Little Green Notebook. I was inspired! I did some "research" through some of my favorite blogs and found great instructions and tips on products at Little Green Notebook and Centsational Girl. The dresser belonged to Scott's parents, so I checked to make sure they wouldn't mind if I updated it. Come to find out... they have a whole set! We took a long six-drawer dresser to match Scott's tall one (thanks!) and I went to work. I went to Sherwin Williams for a paint sample and picked out Creamy - a nice white, not too bright. Paint samples only came in satin finish and I really wanted semi-gloss, so after a couple coats of the satin, I went back for a quart of semi-gloss. 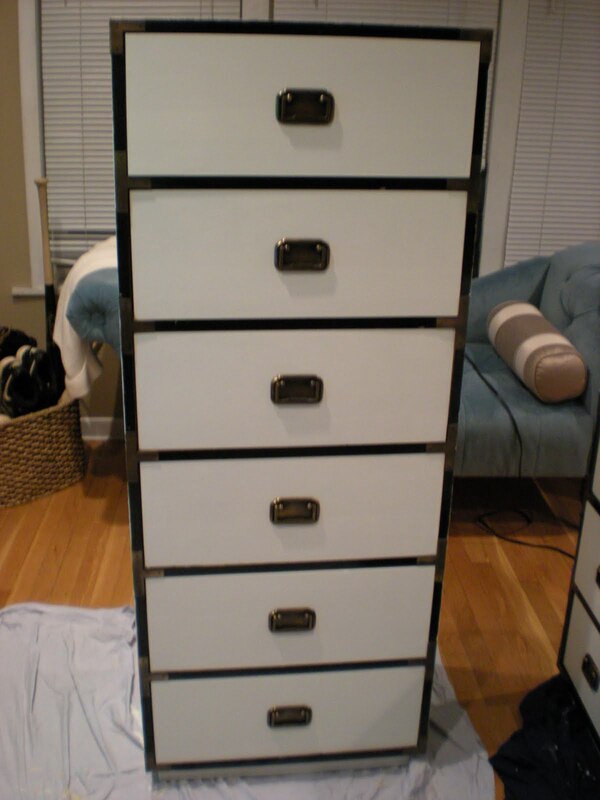 1) Prep work: gathered all my materials, rolled up our living room rug, laid old sheets down, and set up the dressers. 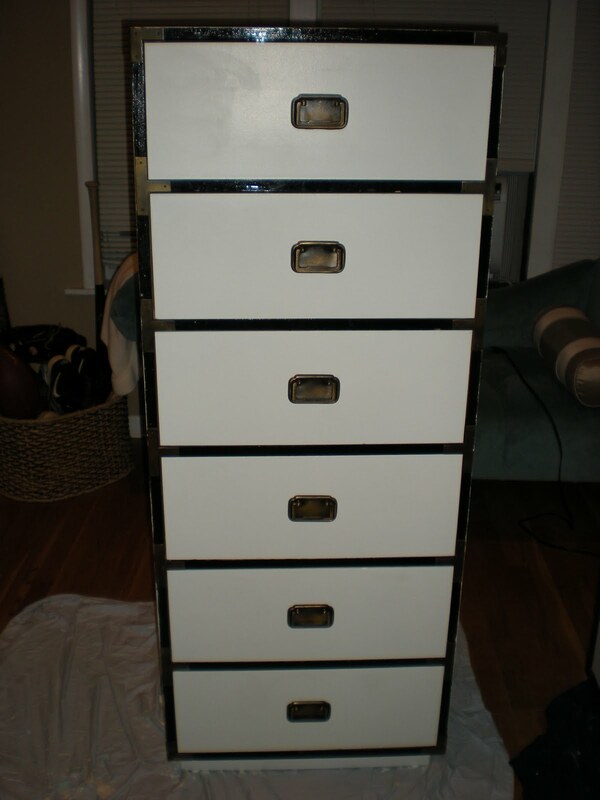 Pulled out all the drawers and removed the handles with a screwdriver. I wasn't ambitious enough to remove the other hardware, but since I was not repainting the black trim, I just left them. 2) Using the sanding sponge, I quickly roughed up all the surfaces I was going to paint. There was a lacquer on the dressers but I didn't worry too much about removing everything since I would be using a primer. 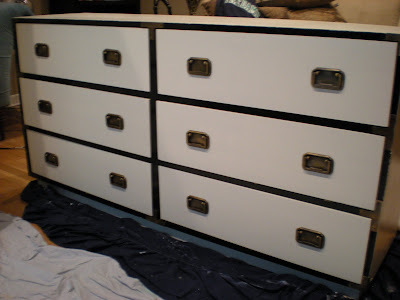 I covered the black trim and hardware with painter's tape. 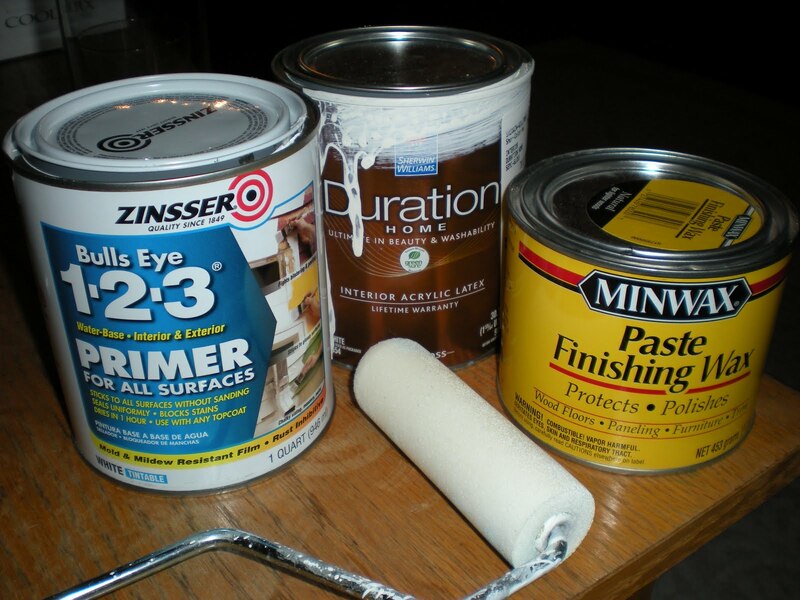 3) I applied one coat of Zinsser primer, a favorite of DIY-ers, to the top and sides of the dressers and drawers with a mini-roller. (Don't forget the tops of the sides of the drawers since you will see them when they are pulled out, as well as the very bottom of the front of the dressers.) I rinsed the roller brush while the primer dried about an hour. 5) I added two coats of satin paint and one coat of semi-gloss. 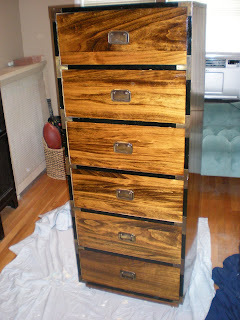 Other people could probably get away with two coats of semi-gloss, but as I said, I was working with a sample at first. 6) After the paint dried for an hour or two, I was really eager to see how everything looked. (It was fine, but it is probably best to wait a little longer if you can stand it.) 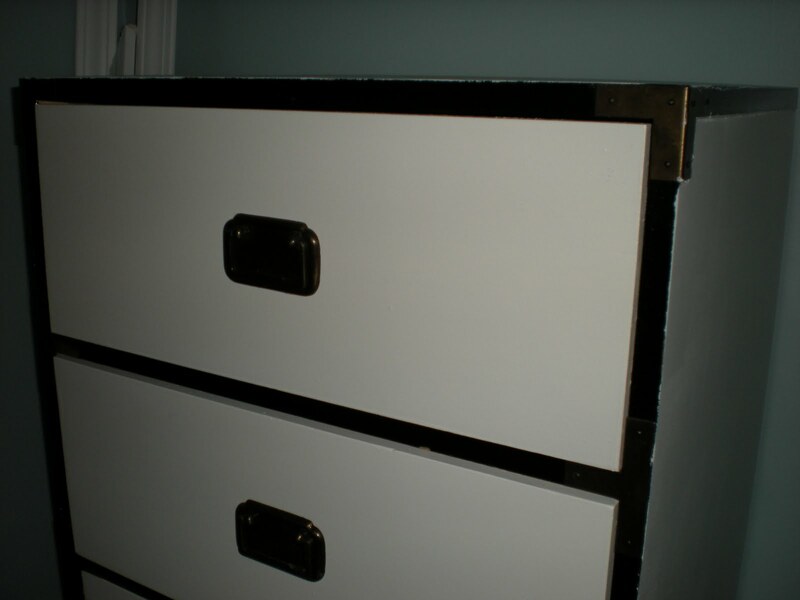 I removed the painter's tape and gently scraped off any paint that had gotten onto the black trim or hardware. I reattached the handles and carefully slid the drawers back into the dressers. LOVE! 7) As a final step, I applied finishing wax with an old white towel. Since I had never used it before, I was not sure how exactly to apply it, but I rubbed the towel against the hard wax in the can and then gently rubbed the towel in small circles against the painted surfaces. 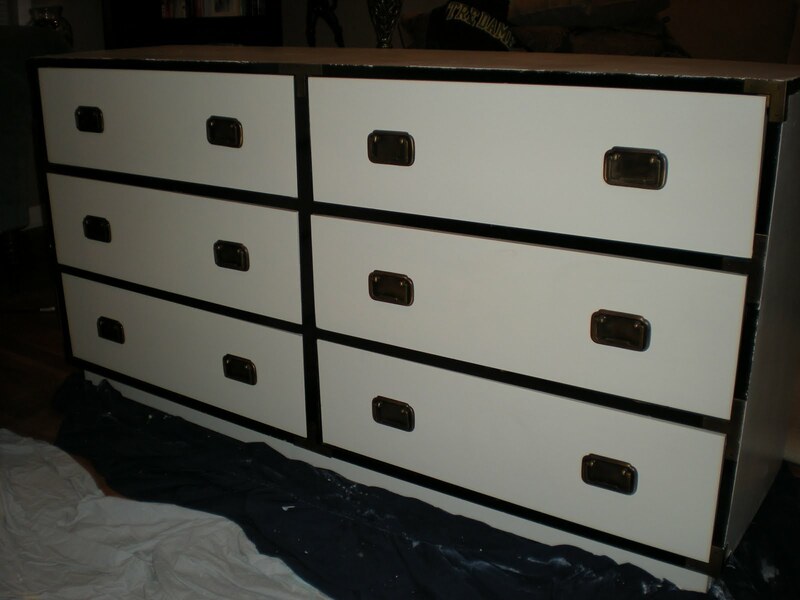 It made me feel like the dressers were "finished" and complete. Finally, here are some "after" pictures (with and without flash - the flash shows detail but looks a little harsh - can you tell I am obsessed?). Stunning! 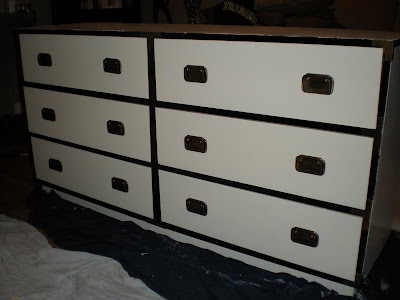 Now these pieces proudly stand in our bedroom... even Scott had to admit he liked what I did to his old dresser! Very nice Mel! I will have to come see you place soon! Thanks! You will have to come visit sometime! I saw these in person. They are even better looking than the pictures show!! I love a good diy! You did a great job with these. I have been searching flea markets for a piece I can refinish. 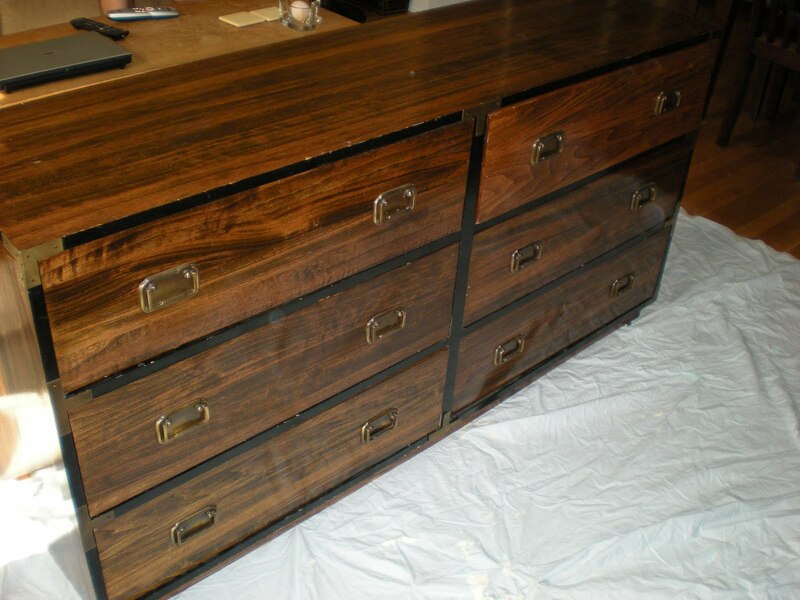 Those dressers are amazing! I can't believe those were just waiting around to be discovered. By the way, I went to SLU with Marie and she told me about your blog. Keep up the good work!